Junior outside hitter Skyler Iott spikes the ball in a game against Alabama A& M. The Colonials swept the match, defeating the Bulldogs in three games. Volleyball scored its first sweep of the season in a five-set win during the first day of the Dig the District Invitational Friday. The Colonials (5–8) downed Alabama A&M 3–0 to start the day and later pulled off a comeback 3–2 win against Morgan State. The team was not sure if it would be able to take the court as planned this weekend after the scoreboard fell in the Smith Center during maintenance Tuesday. Head coach Sarah Bernson said that her squad’s psyche was boosted when they found out they would be able to play on their home court. “You would hope that you don’t need external motivation, but when these kinds of things happen, there was a lot of energy from that and the team was feeling really good,” Bernson said. Junior outside hitter Skylar Iott drove the team’s offense, totaling 34 kills on the day while also adding 28 digs on the defensive end. GW’s service game was inconsistent over the two games, with serve errors coming at critical points in both matches. Sophomore libero Sydney Welch was a bright spot behind the line for the Colonials, tallying five aces on the day. The Colonials struggled with their serves early in the first set, allowing Alabama A&M to pull away early. GW missed four serves, including two before either team had reached double-digit points. Alabama A&M led by as much as four points at one point during the game, but kills from Iott and junior outside blocker Jordan Young paired with attack errors by Alabama A&M helped the Colonials get back in the game. Junior setter Jaimeson Lee and senior middle blocker Alexis Lete combined for a block that put the Colonials on top 13–12, the first time they gained the lead. After Alabama A&M got ahead off a service error and a block error by the Colonials, Young smacked a kill to tie the game again at 15–15. Iott added a kill and a solo block to help GW distance itself from the Bulldogs, and Lete sealed the game with a kill. GW hit for a .125 kill percentage in the first set, but it tallied five blocks while Alabama A&M totaled zero. After the teams traded points to open the second set, the Colonials went on a 5–1 run to give themselves a comfortable 10–6 lead. They stayed ahead for the remainder of the game. GW improved its attack percentage to .263 in the second set and out-swung the Bulldogs 19–10. After putting the Bulldogs away in two-straight sets, the Colonials struggled to take a commanding lead in the third game. The squads were evenly matched until the final points, with Iott breaking a 19–19 tie with back-to-back kills to put GW ahead. The game ended on an Alabama A&M attack error to give the Colonials a 25–21 win in the set and a 3–0 win in the match, their first sweep of the season. After sweeping the Bulldogs in three-straight sets, the Colonials went the distance against Morgan State, taking down the Bears in a five-set battle. GW opened the game with an attack error, giving the Bears an early lead. The squad eventually rebounded to force a late 21–21 tie, but an ace and a block by Morgan State coupled with GW attack errors put the first frame out of reach for the Colonials. The squad struggled with its attack game in the first set – swinging -.029 in the 25–22 loss – while Morgan State hit for a .162 attack percentage. “Going from the first game to the second game, we were pretty high on that win, so coming in we didn’t have the focus or intent that we needed,” Iott said. In another 25–22 decision, the Bears bested the Colonials again in the second set. GW improved its negative attack percentage to .025, but four players hit at a negative percentage for the Colonials in the frame. Iott tallied five kills, but the effort wasn’t enough to stop Morgan State, which overwhelmed the GW defense with 13 kills. At the start of the third set, the Bears continued to shift the momentum in their direction by immediately winning the first point, throwing down a block on an Iott attack. A double block by Lee and Lete brought the Colonials within one point of the Bears. After Morgan State called a timeout, the duo brought down another block to tie the game 24–24. Lete smashed a kill to the center of the court to give GW the lead, and a third block by Lete and Lee sealed the game for the Colonials 26–24 to force a fourth set. Lete said she and Lee are both vocal on the court to keep themselves energized. “We both like to say things to each other that the other side can hear, and it amps us up so we can do better,” she said. Morgan State went on an early run to start the fourth frame, scoring four points before GW had a chance to answer. 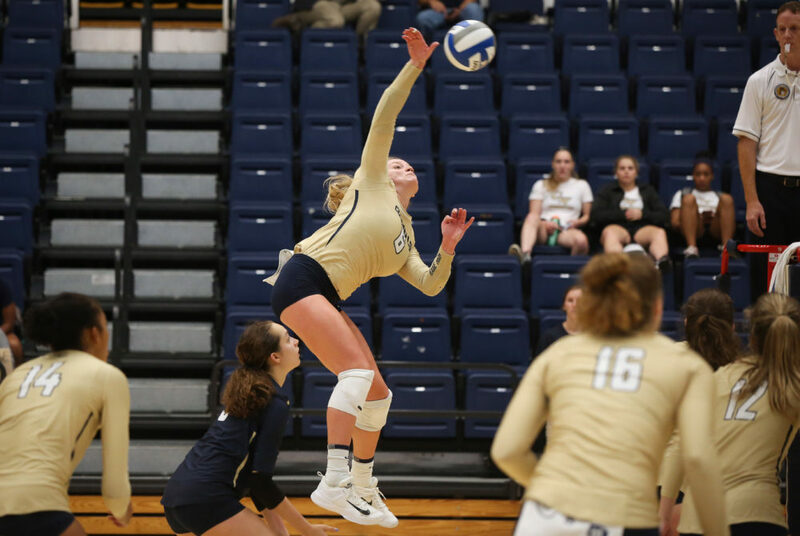 GW was down by as many as five points throughout the set, but the team’s offense picked up its production to out-hit Morgan State 19–11 and eventually take the fourth set 25–21. With the momentum of two-straight wins now on their side and powered by two back-to-back aces from Iott, the Colonials came away with a quick win in the fifth set to complete the comeback victory. After powering the team’s offense in both games, Iott fittingly gunned the winning kill. Due to inclement weather from Hurricane Florence, Hampton canceled its trip to D.C. The Colonials return to action Saturday at 3 p.m. against Coppin State to close out the invitational.